With the K-Messe coming up, it’s great to see Hammer-IMS being featured full-page in the September issue of EPPM magazine. An elegant way to introduce Hammer-IMS and its enabling measuring solutions to plastic processors in Europe and beyond. On K-Messe, Hammer-IMS will demonstrate its Marveloc 602 measurement systems combined with Hammer-IMS’s CURTAIN hardware. This multi-sensor solution offers fast in-line profile measurement in cross-machine direction. Its multi-sensor approach is a clear differentiator compared to conventional methods. The measuring technology of Hammer-IMS is clean, non-nuclear and non-radioactive, and suitable for material thicknesses up to several centimeters. The Hammer-IMS systems measure both transparent and opaque materials in any color as well as rough and shiny surfaces. Moreover, millimeter waves are as affordable as conventional measuring technologies. 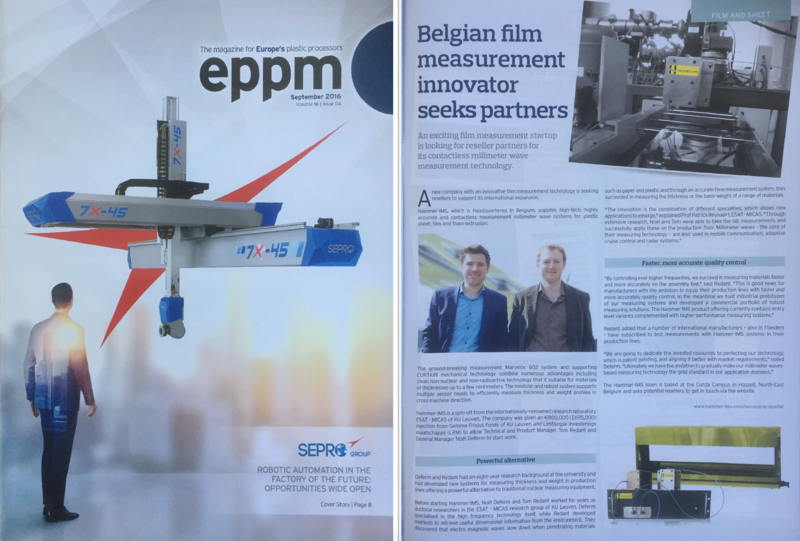 European Plastic Product Manufacturer (EPPM) is the sister publication to British Plastics & Rubber (BP&R), Medical Plastics News (MPN), Middle Eastern Plastics and the world-renowned Interplas and Mediplas exhibitions. Now in its 17th year, EPPM magazine captures the plastics industry in Europe — the key companies and the people within them who make the buying and purchasing decisions.